If you want a photo for an Argentina passport, you'll want to make sure you get one that meets the proper requirements. The best way to do this is by using My Passport Photos since we've had experience with thousands of passports and are well qualified to know what makes them compliant. Look through our Quick Facts for specific information on what kind of photo you'll need, then try us out and see how easy it can be to get a suitable passport photo. If you’re leaving the country with your passport, we also recommend that you check out www.ivisa.com. This will tell you whether or not you need a visa for where you're going, which will save you from having to find out the hard way later. The Argentinian Tourist Visa has a lot of rules that has to be met. You need to submit visa photographs with your application so take to have a good quality photo when applying. Tips on taking a photo successfully if you need to take a photo for a baby. Baby's eyes should be clearly visible and open. If the baby is cannot sit by itself, then you can take their photo in their car seat. take a plenty of photos so you have a few to choose from. My Passport Photo prices are competitive. We offer 2 delivery options via mail or in-store pickup at a CVS, Walgreens or a Walmart store. How to get the Argentina Visa Photographs Online with My Passport Photos? You can use the MyPassportPhotos app with a smartphone or a tablet: iOS here and Android here. Tips to take a high good photo: Your photo should have a white background. Remember to always keep your face i the middle of the photograph. Do not smile or frown too much, try to always keep a neutral expression of your face. What you need to know before getting started: It will take only a few minutes to complete the entire process. Select Argentina at the beginning of the app. Use a smartphone or tablet with the app, you can download your image after or have it mailed or select next day pickup at a WalMart,CVS or Walgreens if you are located within the USA. You can also take a passport photo. Select passport under “Photo Type”. You can get a passport photo for all nationalities. 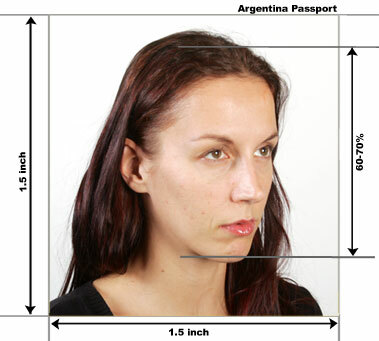 Get the visa or passport photo with the My Passport Photos app today before traveling to Argentina.